Looking for a place to celebrate Mom's day this coming Sunday? Why not visit Blue Bay Walk? It's a new mall in Macapagal Ave cor. EDSA ext., Pasay City. Bring the whole family with you to dine out and shop with your #1 MOM. 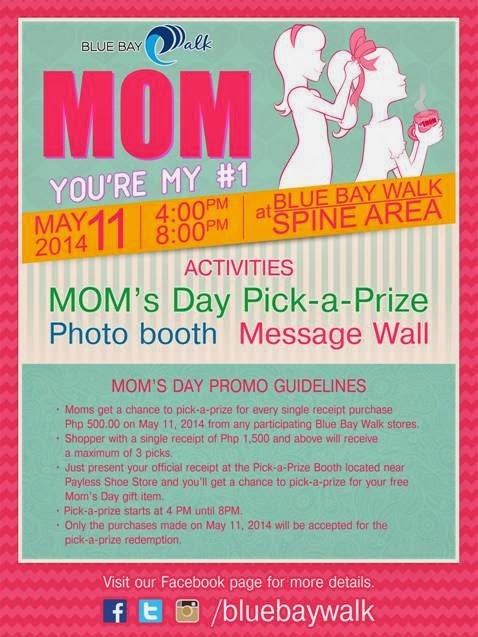 There will be loads of surprises and activities like Pick-A-Prize for the moms, Message wall and Photo booth. So if you are near the area, hope you can drop by and visit the place.